As part of its recent renovation, the Museum of Communication in Bern, Switzerland, underwent a complete transformation. Dutch design company Kossmann.dejong designed a fascinating new permanent exhibition that showcases interactive displays, surprising objects and large-scale projections. 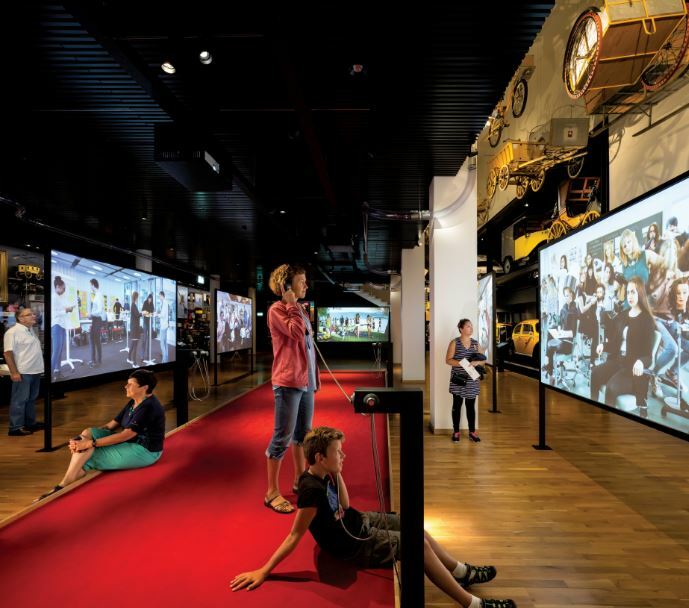 What makes this permanent exhibition particularly relevant is that it puts museum staff in the role of “communicators” by inviting visitors to explore the subject of communication in all its facets. The museum staff assume the role of experts, guides and actors, who encourage people to communicate with each other and engage with the space. To help visitors become aware of their own communication through the exhibition space, the design firm had to go about spatially translating the abstract theme of “communication” into a physical space. Nine key questions such as “Why do I communicate?”, “Which skills do I need to communicate?” and “How do I live in a fast-changing world of communication?” were formulated by an expert team from the museum and form the starting point of the design concept. The communicators ask questions, tell jokes or undertake challenges with visitors. The exhibition scenography is designed to facilitate these interactions. The exhibition is spread across three floors. On one floor, a red carpet was installed to visually connect a collage wall with artefacts on one side of the space to a communication lab on the other side. On another floor, a world of memories is brought to life with a brain sculpture that has nerve endings connected to artefacts, film and memory boxes. The lowest floor takes visitors on a chronological journey through milestones of the communication revolution, from post coaches to drones. Images and quotes from the first users of the time provide context around the story. Integrated films and hands-on activities make visitors aware of the ongoing changes in communication tools and the associated emotions such as euphoria and fear. “Bringing an abstract theme such as ‘communication’ to life within a space requires careful consideration of flooring elements. The architects used flooring elements, such as carpeted sections, in smart ways to connect the various exhibition elements and artefacts. This shows how important it is to consider the flooring during the concept phase of any complex, artistic project,” says Roxanne Mancini, Editor of FLOORS in Africa magazine. Full thanks and acknowledgement are given to www.v2com-newswire.com for the information contained in this article.